Who knows what evil lurks in the hearts of men? The Shadow knows! 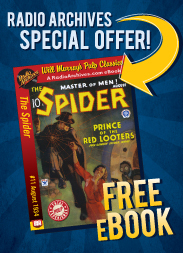 Lamont Cranston takes center stage in three classic pulp novels by Walter B. Gibson and Bruce Elliott writing as “Maxwell Grant.” First, the generous donations of an unknown philanthropist attract the sinister attention of “The Wealth Seeker” and his criminal minions! Then, a “Guardian of Death” protects a crypt’s incredible secret until it’s unearthed by The Shadow! Finally, Lamont Cranston goes undercover in a big city hospital to clear a physician falsely accused of committing “Murders in White.” This triple-novel special leads off with a knockout color pulp cover by George Rozen and also showcases the original interior illustrations by Tom Lovell, Paul Orban and Edd Cartier and historical commentary by Will Murray. "The Wealth Seeker" was originally published in the January 15, 1934, issue of The Shadow Magazine. Here is a villain worthy of the skill which The Shadow, scourge of the underworld, uses to thwart crime and evil in this thrilling tale. This is a good, solid Shadow story, a notch above the pack. While perhaps not the best of The Shadow's adventures, this one still packs a punch and the action keeps you plenty interested right up until the very end. And no loose plot threads! In other stories, most notably some of the later ones, I noticed unresolved plot elements that annoyed me. None to be found here. This is a tale of wealth. One man has wealth; one man seeks to obtain it. And The Shadow must stop him! The Shadow must track him back through his henchmen, through the mobs that he has sent to acquire the millions. The Shadow must determine his secret identity and put an end to his evil. It all starts with a philanthropist who wishes to remain anonymous. This wealthy mystery man is known for giving cash to needy persons recently put out of work. He's given cash to survivors of wrecked ships. Cash to victims of fire tragedies. And the scum of the underworld are quick to note that this man, whoever he is, must have an abundance of ready cash available and within easy reach. All that available cash is quite a lure to the unscrupulous! They are bound to find a way to get it. The wealthy mystery man is known to the recipients of his charity only as Dorand. Some hidden mastermind in the underworld has discovered that Dorand is in reality the multi-millionaire Folsom D. Satruff. He's determined to capture all the wealth that Satruff obviously keeps in the strong room of his Long Island mansion. The first attempt to break into Satruff's home is thwarted by his friend and guest for the evening, Lamont Cranston. No, not the "real" Lamont Cranston; this is really The Shadow in his oft-used disguise of Lamont Cranston. The Shadow foils Pug Hoffler and his mob as they attempt to storm the mansion and break into the strong room. But there will be other attempts. The Shadow knows! The Shadow must find the person behind these attempts. Could it be young Doctor Wesley Harlow? Harlow is one of Manhattan's outstanding nerve specialists, a friend of Satruff's, and is always conveniently present during the attempted robberies. Perhaps it's old Tobias McEwen, the attorney. He has been Satruff's legal representative for many years, but has a sly look about him. Let's not forget old Bartlett Okum, Satruff's pallid, cadaverous servant. He's worked for Folsom Satruff for years and knows he uses the pseudonym of Dorand. Or is it Riggs, the house servant? Maybe the butler did it! Only The Shadow can thwart the frenzied attacks upon the Satruff mansion by the sinister denizens of the underworld. Only The Shadow can reveal the true plans of the hidden mastermind. Only The Shadow can expose the secret motives of the various players in this wonderful early Shadow tale. Let me make note of some points of interest. We visit the dismal gangland hang-out known as "Red Mike's" and see bottles of bootleg booze on the shelf. This story was written by Walter Gibson in May of 1933 when the United States was still under Prohibition and liquor was illegal. Prohibition ended on December 6, 1933 and booze flowed legally. So when this story appeared in print a month later, it must have amused readers who knew that booze no longer needed to be bootlegged. And speaking of underworld dives, The Black Ship also appears in this story, as does a passing reference to The Pink Rat. Those speakeasies had such colorful names--literally! Red, Black, Pink. And the characters who frequented them were just as colorful in their own ways. Only a pared down cast is included in this story. Police Commissioner Ralph Weston, Detective Joe Cardona, Harry Vincent, Cliff Marsland and Burbank are the only continuing characters present. Of course, The Shadow appears in his frequent disguise as Lamont Cranston as well. There is a brief mention of a doctor, but he isn't identified by name. After a gun fray at Red Mike's, Cliff Marsland is injured. The Shadow saves the day, and whisks Cliff to safety. Later, we are told that "with Cliff in capable hands of a physician, The Shadow would be free to follow his own quest." I'm going to assume that this physician was Dr. Rupert Sayre, The Shadow's personal physician. He had appeared in two magazine stories previous to this, "Master of Red Death" and "Treasures of Death", both from 1933. So it only makes sense that when The Shadow needed the assistance of a medico, he would see Dr. Sayre. According to this story, Cliff Marsland carries a .45 automatic. Funny, I thought that the .45 was strictly used by The Shadow. 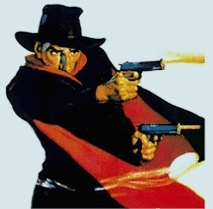 I don't remember any other Shadow story specifying that Cliff carried a .45, so maybe this was a slip on Gibson's part. Appearing in this tale are the famous rubber suction cups that The Shadow uses to climb the sheer side of a brick-walled hotel. I always look forward to the squidging noise those discs make. And also in this novel we are treated to The Shadow's method of communicating to his agents via the announcer on radio station WNX. Emphasized words spell out a secret message that only his agents are trained to hear. I'll have to admit that Walter Gibson's surprise ending did actually catch me off guard. I thought I had it all figured out long before the big reveal. I was certain I had seen my way through all the red herrings and false clues, and I knew who the mastermind behind the robbery attempts really was. But I was wrong. Walter Gibson, that master spinner of mystery tales, had fooled me once again. When the master criminal was finally revealed, I had to admit sheepishly that it all made sense, but I had just failed to see it. I think you'll have a lot of fun with his Shadow story. It's tightly written and shows off our hero's abilities at their best. It gets my thumbs up! "Guardian of Death" was originally published in the January 1945 issue of The Shadow Magazine. An eight foot bronze statue of an angel that stands outside the massive steel doors to the crypt of Graydon Towers: that is the Guardian. Not only does it guard the vault and its contents, but it also harbors an amazing secret--a secret that only The Shadow can discover. This was a pretty good Shadow adventure. An auspicious start for the year 1945. In fact, this is probably the best story of the entire year. It has plenty of action, moody nighttime settings and some interesting secrets which are all divulged in the last few chapter. Surprisingly enough, it's a short novel, judged by Shadow magazine story standards. This story is barely thirty-three thousand words; most earlier Shadow adventures were in the forty-five thousand range. But it doesn't feel unusually short. It doesn't feel truncated. If the editors at Street & Smith did some cutting of the story, it was skillfully done and doesn't show. That was not always the case with other stories of this era, unfortunately. Some contained references to scenes that were obviously cut. But not this one. This story reads very smoothly. It was a dark and stormy night. Yes, that's a cliche, but in this case it promises an exciting beginning to a very engaging tale. Harry Vincent, agent for The Shadow, is outside Graydon Towers in that storm. Graydon Towers is a strange old three-story stone castle. Vincent stands in the pounding rain while thunder and lightning crash around him. He has been sent there in advance of The Shadow to see if anything is awry. But before he can sneak inside, he is drawn into a gun battle between two opposing forces in the rainy night. In the midst of the shoot-out, Vincent literally runs into a young woman outside the mansion. Even though it's dark outside and rain is pouring down, Harry can tell she's a very lovely girl whose looks are good enough to withstand the effects of the drizzle. All of which sets up a hinted romance angle to the story. The drenched young beauty disappears in the night. Probably for the best, because Harry has other things to deal with. He needs to figure out who is shooting at whom. And why. He surreptitiously follows one of the mysterious parties to the nearby town of Kanakee Junction, about four miles away, where he loses him. Vincent goes to the train depot and wires The Shadow a one word message: "Come!" The next day finds Harry at the local hotel, rested but still confused about the previous night's encounter. Luckily he runs into an insurance investigator by the name of Jeff Gerster who fills him in on the background of that unusual structure known as Graydon Towers. Graydon Towers was named after Gifford Graydon, the famous art king of the 1920s, who had it built and died soon after its completion. The crypt is currently scheduled to be opened after twenty-five years so that Jerome Hybart, an antiquarian who was appointed custodian of the Graydon art collection, can produce the archive records. These contain records of over a half a billion dollars' worth of rare art. These records were compiled by Graydon during World War I, indicating which art treasures being circulated were fake and which were genuine. The records were sealed at his death, to be opened only in the event of a second world war. As World War II was now in its last stages, the archives have been ordered to be opened in order that the huge influx of art being smuggled out of Europe can be authenticated. And this could be a major problem for some unscrupulous art dealers. Dealers who stand to loose millions in commissions if certain works of art are found to be frauds. One such art dealer is in town, awaiting the opening of the vault. Hugo Atmore has sold several million dollars' worth of art brought into the country by refugees desperate to sell their treasures for enough money upon which to subsist. If the records kept in the Graydon vault prove the art works to be fake, reimbursing his fleeced customers would bankrupt the man. Not to say, destroy his reputation. Also in town is Elliot Huxford, an art collector who is keeping an eye on the shady dealings of Hugo Atmore. Huxford would be more than happy to see Atmore revealed as the shyster that he truly is. He wants to make sure the Graydon Archives are kept safe until their public display. Soon, The Shadow arrives in town. He comes in on the local train, in his frequently-used disguise as millionaire world-traveler Lamont Cranston. In that guise, he visits Graydon Towers along with Vincent, investigator Gerster, dealer Atmore and collector Huxford. All are welcomed by the custodian of the Graydon art collection, Jerome Hybart. But none more so than Lamont Cranston. Cranston has a reputation which has preceded him. As Hybart puts it, "You are the man who furnished a first-hand description of the silver coffin of Temujin, otherwise Genghis Khan." This is in reference to the earlier Shadow story "Masters of Death" from 1940. It was this story in which The Shadow's ultimate nemesis Shiwan Khan entered the country hidden inside the silver coffin of Temujin. That coffin was destroyed in a blazing inferno at the end of that tale, so Cranston's first-hand description of it would be the best available information on the relic. It's nice to see author Walter Gibson give passing reference to earlier Shadow stories. Now that The Shadow is on the scene, the action really starts! Who is the mysterious figure behind all the activity who seeks to reach and destroy the Graydon Archives? Why seek their destruction? And what is the secret of the Guardian Angel, that gigantic bronze statue that sits outside the vault? Only The Shadow can reveal the secrets of Graydon Towers. 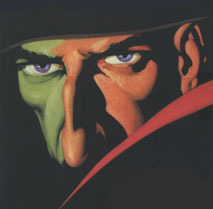 At times, this 1945 version of The Shadow seems closer to the early 1930s version of the character. By 1945, the crime-fighter had been watered down a bit. He shot to wound, not to kill. And in the few cases where he did aim for the heart, there was always some coincidence that caused the bullet to be deflected from it's true course. But in this story, The Shadow actually shoots to kill, and succeeds. He downs four thugs at the tale's climax. Slugs right through the heart. Now, that's more like the earlier Shadow that we all remember! Harry Vincent is the only recurring character to appear in this story. There is no sign of any other agent. No sign of lawmen Joe Cardona or Commissioner Weston, which makes sense since the story's setting is well outside New York City, in Beaverwood County in some unnamed state. The Shadow appears in his frequent disguise as Lamont Cranston. He also appears briefly as a stoop-shouldered, bearded hunter. And later, after Cranston has apparently returned to Manhattan, he appears as old Isaac Twambley. Twambley, was a recurring disguise of The Shadow. Phineas Twambley appeared in three magazine stories between 1932 and 1935. Then, he mysteriously was absent until 1944. At that time, he returned as Isaac Twambley in seven more stories. This was the second of those seven references. Both Phineas and Isaac Twambley were basically the same character, a kind-faced old man. Only the first name changed. Author Walter Gibson later explained that Isaac was intended to be the nephew of Phineas, since so much time had passed since Phineas's last reference. Personally, I'm of the opinion that this explanation was created years later to fit the facts, and the truth is that Gibson simply forgot Twambley's first name when he reintroduced the character after a nine-year absence. As for Harry's love interest, nothing comes of it. The young beauty that he ran into in the storm back in chapter one turned out to be Miss Linda Graydon, grandniece of the deceased Gifford Graydon. Throughout the story, various acts of fate seem to step between them, causing unjustified suspicion on the parts of one or the other. Finally, at the story's end, all is revealed and no more suspicion is cast upon either of the two young people. Harry is seen gazing intently into the light upon her coppery hair. We don't find out any more about the budding romance, but it is my guess that after The Shadow mopped up the gang of criminals, unmasked the unknown character behind it all and returned to New York, Harry might have stayed around Kanakee Junction a little bit longer. You couldn't blame him. This is a Shadow mystery that you will enjoy. Great atmosphere in the old castle. Thrilling action in the underground crypt, out in the forest and along the train tracks. Easily considered the best of 1945, I can recommend this one. "Murder in White" was published in the February- March 1947 issue of The Shadow Magazine. It's the white of a hospital. The Rabout Memorial Hospital, where murder has taken place. And more murder yet awaits. Elliott was an OK mystery writer. He was just a bad Shadow writer. He completely ignored the characters that had been established for so many years. He may have occasionally used their names, but they acted nothing like they should have. And he didn't even try to match the dark tone of the originals. The plots were nothing like Walter Gibson had been writing since 1931. Instead, they were murder puzzles that the protagonist exposes in excruciating detail at the story's end. As I've mentioned before, many of Elliott's Shadow stories had the feel of being some mystery novels that Elliott had written in earlier years and had been unsold... then recycled when he was hired to write for The Shadow. This story, especially. I can easily see him taking some old story and changing the names of the characters to match Lamont Cranston and Commissioner Weston. Then throw in a single line that says "Once again, The Shadow knew!" And, hey, you've got yourself a Shadow pulp story! Note that this issue of the magazine covered a two-month period, February-March. Yes, the magazine had fallen upon such sad ways that it could no longer support a monthly publication. It was now relegated to bimonthly. Could this be blamed on the change in The Shadow's writer to Bruce Elliott? Far be it for me to cast stones... but yes, I think so. As to the plot, let's keep it brief. Thomas Melltin, prominent industrialist, died in Rabout Memorial Hospital. He went in for a simple operation; there should have been no complications. So Dr. Arnold Bennit is being accused of malpractice. Lamont Cranston agrees to help out, and fakes a broken arm to enter the hospital under the assumed name of Larry Crimmins. Once he's on the inside, he can investigate. But he can't investigate as The Shadow, because everything's white and the lights are never turned off. He can't blend into the darkness. There is no darkness! And that's the explanation we're given why The Shadow never appears. Lame. So Cranston wanders around the hospital, his arm in a cast, looking for clues. Soon, another man dies. Francis Jolas, a stock promoter, expires in the hospital of complications from alcohol poisoning. And it turns out there is a connection between Jolas, Thomas Melltin and Dr. Arnold Bennit. They all used to be partners in a mining operation. Now Dr. Bennit's the only one left. Lamont Cranston must work to clear Dr. Bennit. But is he really as innocent as he claims? Who else is involved? And how are these "accidents" being intentionally accomplished? Cranston whips out the solution in amazingly short order. Or "mercifully" short order, as it were. This story is mercifully short at under 19,000 words. Walter Gibson's Shadow novels were usually in the mid-forty thousands, by comparison. You won't get many insights into The Shadow or the cast of regular characters by reading this story. That's because so few are present. Commissioner Weston appears, representing the law. And Moe Shrevnitz appears. Harry Vincent and Burbank make very brief token references. Moe is only referred to as "Shrevvie" and Burbank runs a telephone answering service. Yes, this is definitely a Bruce Elliott story. Not anything like The Shadow pulp mysteries we know and love. The original title of this story, when submitted to Street & Smith, was "Dead Wrong." The editors changed it. Perhaps it was because they recognized how close to the truth was that original title. This story is "Dead Wrong" in so many ways. As a Shadow mystery novel, it's Dead Wrong. Wrong... wrong... wrong! Now you can go strike your thumb with a hammer... or you can read this "Shadow" pulp story. Personally, I think the hammer option would cause you less pain.